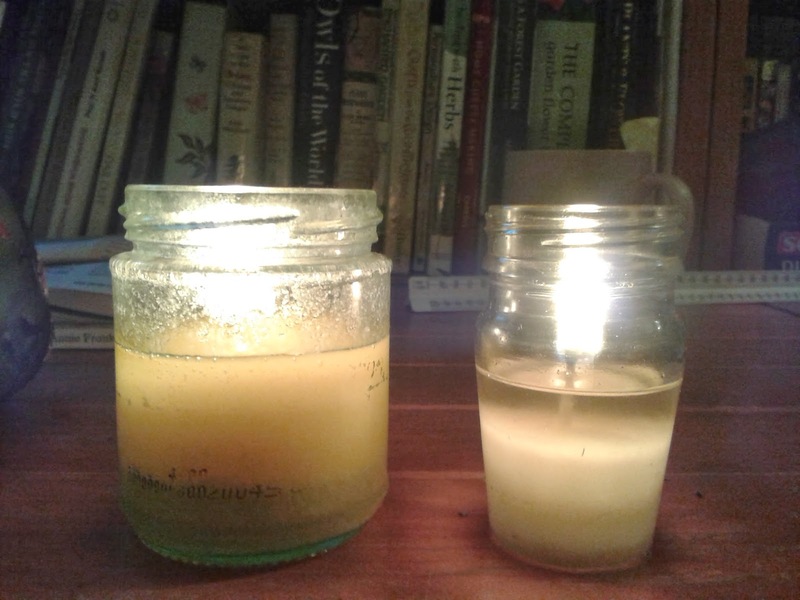 With talk of power cuts, ones thoughts turn to candles and alternative forms of light (and heat for that matter) Here is one that Dee spearheaded. He read about making emergency candles from all sorts of things like tins of tuna in oil, cheese wax and butter etc. So in the spirit of experimentation, he set out to make a candle from butter. He put about 1/2 pound (230g) of butter into a glass candle jar and put that into a pot of hot water to melt. He stuck a wick in it and lit it once it had set, it splutters from time to time as the water present in the butter gets close to the wick. It appears to be a highly efficient candle, in 8 hours of burning, it has only used about 1/5th of itself, and it burns quite hot. The tallow candle is made from the fat from beef or lamb that has been clarified through heating, cooling and sieving until a solid, waxy substance forms, this waxy substance is tallow, once put into a jar with a wick, it will function as a candle. Thanks Zaneta. I will try eBay. Never thought of that.